South of Rome in the region of Campania is the Amalfi Coast. It is the undisputed king of Southern Italy vacation destinations. It is located on the Sorrentine Peninsula facing the Mediterranean sea. Southern Italian resort towns like Amalfi, Positano, and Ravello are all located on the Amalfi coast. On the other side of the Sorrentine Peninsula, facing the Bay of Naples is Sorrento. History was literally written on the Bay of Naples and Sorrentine Peninsula. The Naples Archaeology Museum is one of the most important museums in Western Civilization. Pompeii and Herculaneum provide windows into ancient Rome. Out on the islands of Capri and Ischia remnants of the Hellenic civilization and ancient Greek colonizers are everywhere. Today the resort town of Sorrento, with views of Mt Vesuvius and the Bay of Naples, is the gateway to the Amalfi Coast. To reach the towns along the Amalfi Coast it is a hair raising drive along cliff side roads. 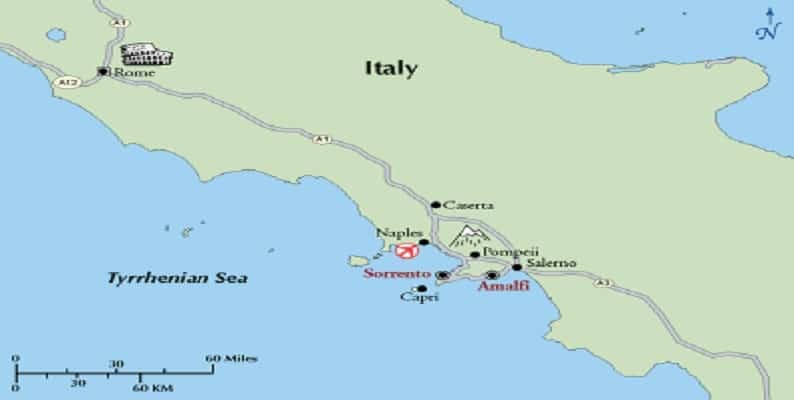 Or you may cruise around the Sorrentine Peninsula to the Amalfi Coast by ferry. Click the links below for more information about the best Amalfi Coast vacation packages. For tours of southern Italy including Calabria, Basilicata, and Puglia click here. 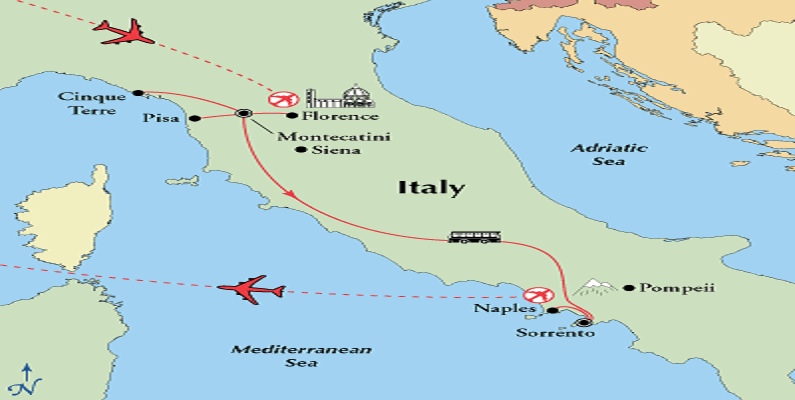 Independent Fly and Drive Vacation Packages – Includes Amalfi or Sorrento hotel, rental car, and airfare to Naples. Or use our drivers for transfers and tours. For more information click here or see below. Escorted Tours – All inclusive vacations that include accommodations, transportation, guided tours, some meals, entrance fees, and may be inclusive with airfare. Hiking Vacation Packages – Hike along the mountain trails that rise 2000 ft above the Amalfi Coast. Hiking trail maps, hotels, and transportation services all included. 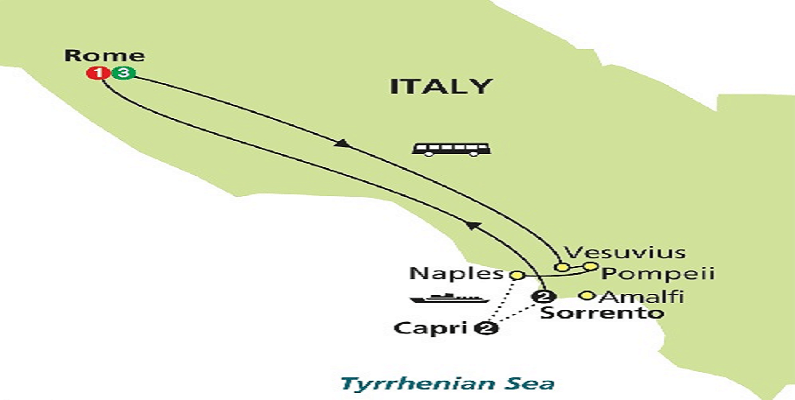 Cruises – Cruises to southern Italy along the Amalfi Coast tender in Sorrento, Amalfi, and Capri. 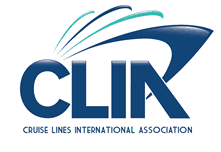 For more about Italian cruises to southern Italy click here. 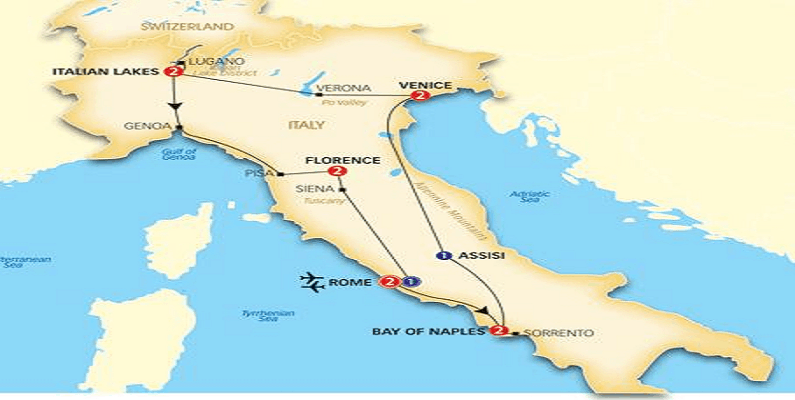 Shore Excursions – For Amalfi, Sorrento and Naples shore excursions click here. /italy-travel-packages/amalfi-coast-vacations/The all inclusive fly and drive trip to southern Italy includes airfare from New York, car rental, and 6 night hotel. Enjoy a rental car to explore the area independently at your own pace. With your car you may visit Paestum to see the world’s best preserved Greek Doric Temples. You may also go to Caserta to visit the Royal Palace. Discover Sorrento, Positano, Ravello, and Amalfi. Take a day trip to the island of Capri. Click here for more details on this Amalfi Coast fly and drive vacation. All Amalfi Coast tour packages may be booked with air or land only. Naples is typically the airport serving the Amalfi Coast area. 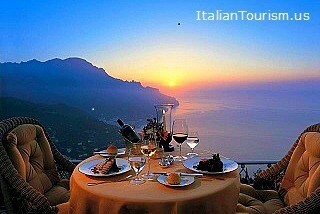 Click the links below for more details about each all-inclusive Amalfi Coast tour package. 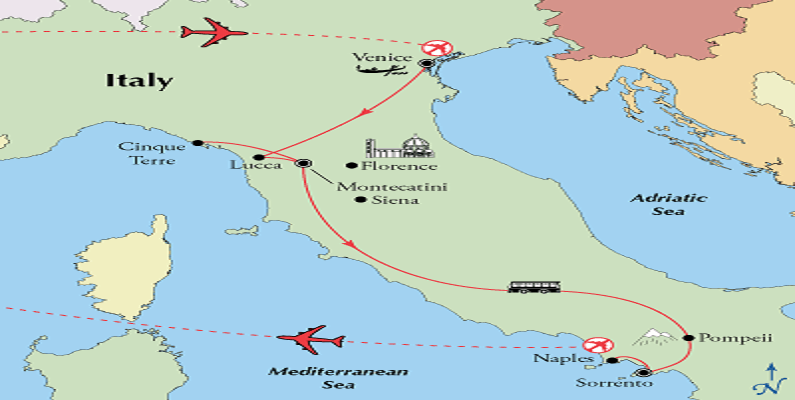 This package is also an escorted tour that includes Tuscany and southern Italy. After 4 nights at the Spa town of Montecatini and touring Tuscany travel by motorcoach to Sorrento. There in the resort town over-looking the Bay of Naples and Mt Vesuvius stay for 3 nights. Click here for more details. 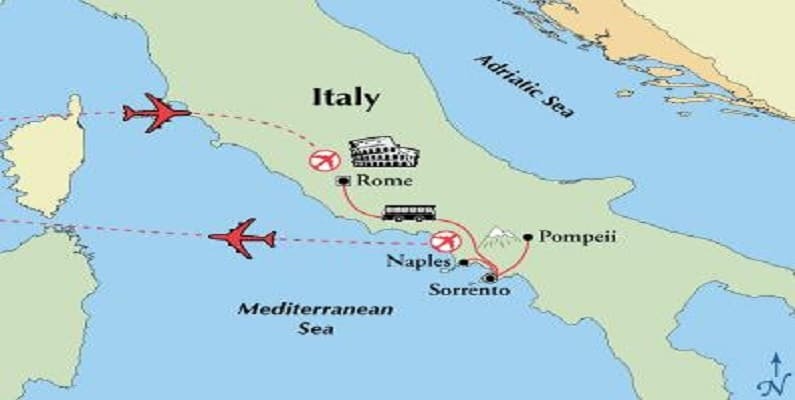 The 10-Day Rome and Southern Italy tour includes 4 nights in Rome, 2 nights in Capri, and 2 nights in Sorrento. This trip travels round trip from Rome. Enjoy 6 nights in Italy split between Rome and Sorrento. This is an escorted tour from Rome. Travel is by motorcoach to Sorrento. You then may return from Naples airport. This vacation package includes 3 nights in Rome and 3 nights Sorrento. Click here for more details. The Venice Tuscany Amalfi Coast tours package includes a guided tour of Italy from Italy’s northeast to southwest, beginning in Venice, then to Montecatini in Tuscany and finally to Sorrento where you’ll visit the famed Amalfi Coast and Pompeii. The Venice Tuscany Amalfi Coast tour package journey south will have you experiencing Italy’s rich scenery, art, culture, food and wine! Add Rome and Tuscany to the Amalfi Coast for a slow paced central Italy to southern Italy tour. Enjoy 10 nights in Italy. 4 nights are in Tuscany. 3 nights each in Rome and Sorrento. 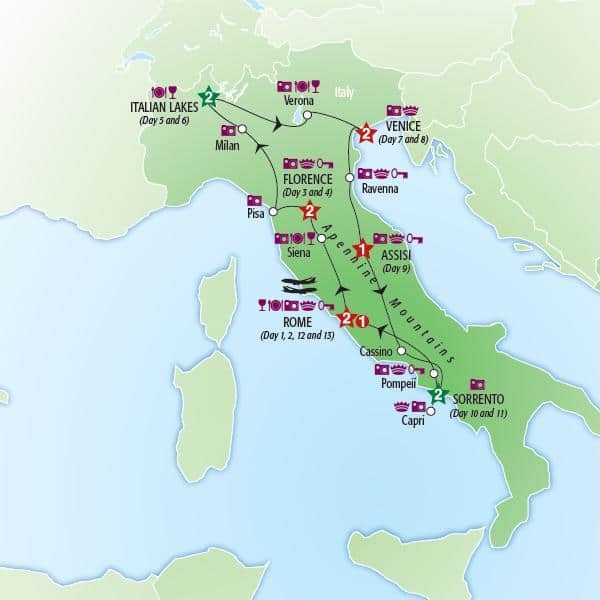 For those looking for a laid back slow paced Italy tour with plenty of free time this is a good vacation package. Click here for more details. The Italian Lakes, Venice, Tuscany, Amalfi Coast tour package includes 11 nights in Italy. Fly into Milan. Depending on departure day the trip begins with two nights in either Baveno on Lake Maggiore or Como on Lake Como. Then enjoy Venice for 2 nights. You’ll tour Tuscany for 4 nights, and finally travel to southern Italy for 3 nights in Sorrento. Click here for more details. Visit Italy’s Big 3 cities Venice, Florence, and Rome. Plus tour Milan and Lake Como. This Lake Como, Italian Cities, and Amalfi Coast trip includes 2 nights in Como, 2 nights in Venice, 2 nights in Florence, 3 nights in Rome. End the trip with 2 nights in the southern Italy resort town Sorrento. Click here for more details. The Venice, Tuscany, Amalfi Coast, Rome Italy tour package with air is an all inclusive two week escorted tour of Italy. Visit these beautiful regions of Italy. You’ll travel from Venice in the northern Italy to the Amalfi Coast in southern Italy. 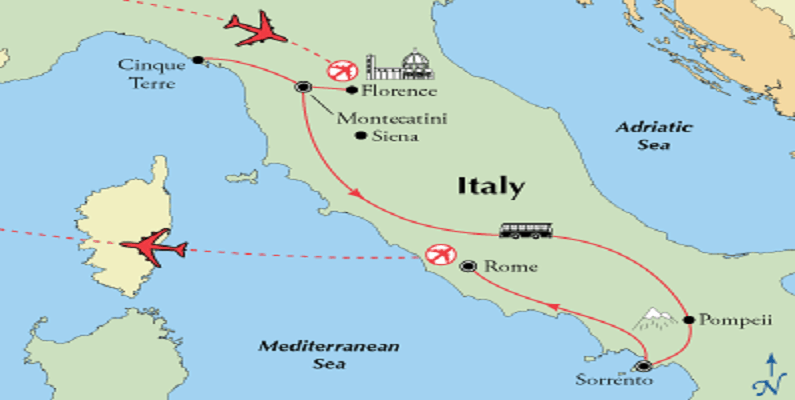 Along the way you’ll tour Tuscany including Florence, Lucca, Cinque Terre, and Siena. You’ll also have extended time in Sorrento. Here you’ll tour Pompeii, the Amalfi Coast and may visit Capri. Travel around Italy round trip from Rome. Start your vacation with 2 nights in Rome. Then travel to Florence for 2 nights. Then visit the Italian Lakes for 2 nights. Then to Venice for 2 nights. Heading south to the Amalfi Coast there is 1 night in Assisi. The trip then includes 2 nights in Sorrento before moving on to Rome for the final night. Click here for more details. The 14-day Lake Como, Italian Cities, and Amalfi Coast package tours Italy’s Big 3 cities Venice, Florence, and Rome. Plus tour Milan and Lake Como. 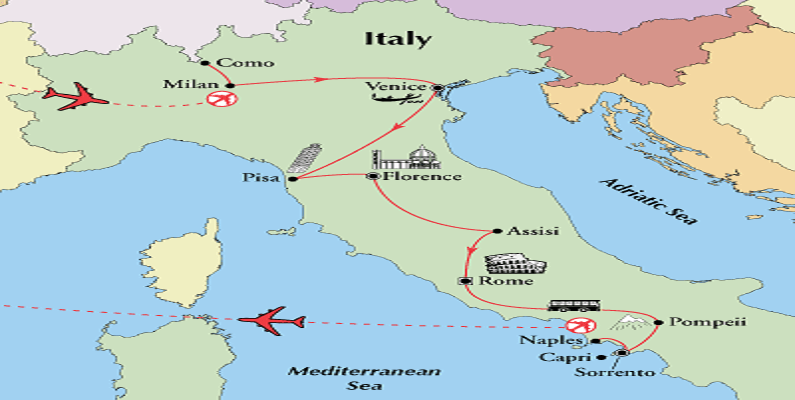 The trip includes 2 nights in Como, 2 nights in Venice, 2 nights in Florence, 3 nights in Rome. End the trip with 3 nights in Sorrento. Click here for more details. 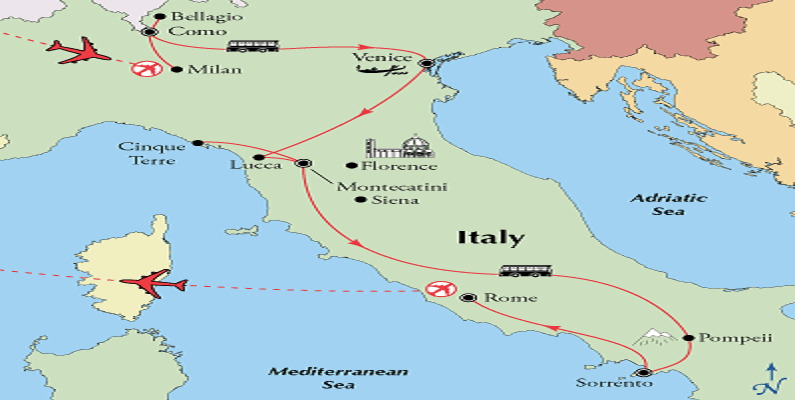 Add 2 nights in Lake Como to the 14 day Venice, Tuscany, Amalfi Coast and Rome tour. 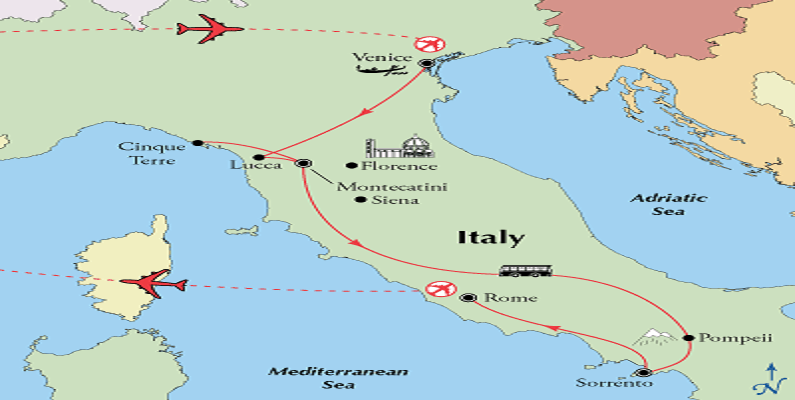 This tour of Italy includes two full weeks, 14 nights, in Italy. Fly into Milan with first 2 nights in Lake Como. Then travel across Italy to Venice where you’ll spend 2 nights. Then travel to Tuscany where you will enjoy 4 nights in the SPA town Montecatini. Then travel to the Amalfi Coast for 3 nights. End your vacation in Rome with 3 nights. 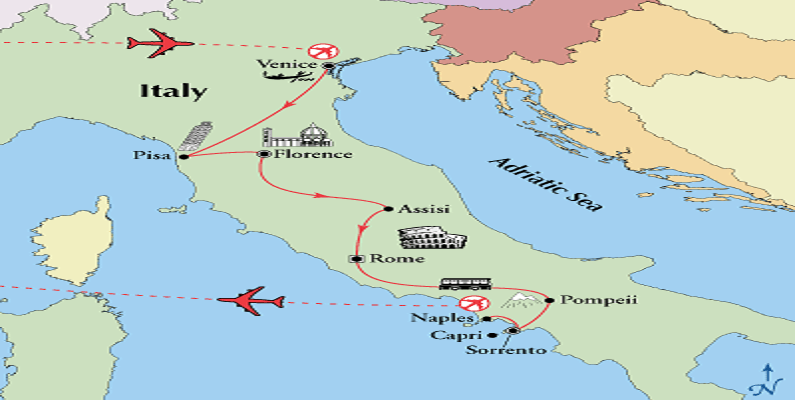 Click here for more about this two week leisurely tour of Italy. If you are planning a vacation to the Amalfi Coast and cannot find the vacation package you are looking for on this page or have specific requests click here to contact us or call ItalianTourism.us 800.227.1577.